Bring together a group of talented orthopedic surgeons, including one who is an experienced Ironman, and you get the successful Park Avenue medical practice of Manhattan Orthopedics Sports & Medical Group. They came to Studio K&M because their previous site was out-dated and difficult to find on the web. 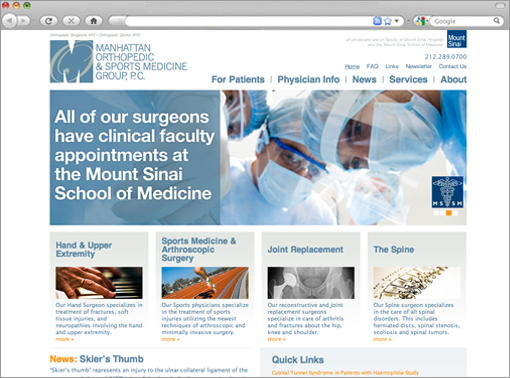 We worked with Manhattan Orthopedic to build a site with an easy to update Content Management System and with guidelines for creating content that users want to see. The site now ranks at the top of google; in the first six months, the site has amassed nearly half a million impressions, 6,643 website visits, 629 phone calls and 4,679 web events.